Welcome to Jeff's online store. Choose from the categories below to view products. Jeff's product line includes on demand educational video, PDF books; pit bull products and gifts and more!! 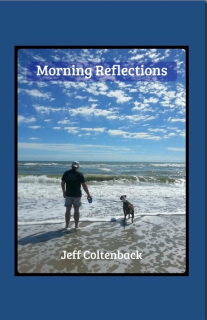 This book of daily reflections is a compilation of thoughts from the author's morning meditationsover the course of a year. From January 1st toDecember 31st, the author shares a positive,thought provoking message for each day of theyear. Start your day off right with positive thoughts.Shape your life one thought at a time, one word at atime, one action at a time and one day at a timewith these inspirational messages by the author.Think, speak and act positively! Join the author as he recounts the life of his beloved pit bull, Amber. Amber was a therapy dog and dedicated her life to helping others: both people and dogs alike. On March 16, 2011, at an apartment complex in Newark, New Jersey, a city maintenance worker happened upon a trash bag that appeared to be moving. Inside was the emaciated, crumpled body of a barely breathing red dog. Animal control was dispatched and the young pit bull was transported to a Veterinary Clinic. Incredibly, and against odds stacked heavily against him, he survived the night. When he opened his eyes on St. Patrick’s Day, March 17, it was nothing short of a rebirth, hence the dog being named after the patron saint celebrated on that date. As a nation and world of animal lovers followed his inspiring recuperation over the next several weeks, Patrick’s story took on another twist. A highly publicized custody battle broke out, and dog trainer Jeff Coltenback was enlisted to evaluate the dog that captured the world. Jeff’s immediate and life changing bond with Patrick went beyond evaluator and subject. As a recovering drug addict turned successful trainer, business owner, and recognized pit bull advocate, Jeff too had before experienced a rebirth. Detailed in this book are the events that led up to Jeff’s meeting with Patrick, his evaluation itself, and an overview of the public court hearing he attended on Patrick’s behalf. Also included are some of Jeff’s personal experiences with other abused pit bulls. In addition to his desire to share Patrick’s story, the author hopes that this book will inspire others to become more actively involved in animal welfare, rescue and advocacy. If ever a story could motivate a reader to rescue a dog, this is it. The author reminds us that we are our brothers’ keepers, and sometimes…our brothers are pit bulls. This book offers insight into some of the daily practices of the author that helps him lead a life of happiness. The author's goal is to help you be happier despite what life throws your way. This book entails actual practices and habits that the author engages in. "30 Days to the best month of your life" empowers the reader to be happy despite life's challenges and provides tools and awareness that will contribute to physical, emotional, mental and spiritual balance. This book suggests adding each of the 30 days to your daily life, one day at a time. Before long, "30 days to the best month of your life" will promote a happy, content and balanced state of mind!! Signed Copy - Shipped direct from Author. Join the author as he recounts the life of his beloved pit bull, Amber. Amber was a therapy dog and dedicated her life to helping others; people and dogs alike. Amber touched the lives of thousands of people over her life and she exemplified the true nature of the pit bull. The author illustrates and celebrates Amber's life from puppy hood to the day she died. Experience the love of a man for his dog in his own words. Another version of Jeff Coltenback's protected copyright quote in a sleek 9" X 12" frame. Two backgrounds to choose from: Matte Gray or Matte Gold. This makes a great addition to any wall in your house, office or business. Makes a great gift for the pit bull lover in your life too!! Show ff your pride with this one of a kind pit bull t-shirt that includes a copyright quote from Jeff Coltenback. This quoted t-shirt can only be purchased from Jeff Coltenback duein accordance with U.S. Copyright law. Act now and promote our beloved breed in style with this comfortable t-shirt that will surely educate people about the true and loving nature of the pit bull! Pitbull quote desk or table sign - Makes a great gift! Pit bull quote desk or table sign - Makes a great gift! Show off your pit bull pride and educate others at the same time. Or, give it as a gift to the pit bull lover in your life! Free shipping available in the USA only. click on t-shirt below to order! !